When the trailers for Disney's Wreck-It Ralph sequel - Ralph Breaks the Internet - dropped way back in early 2018, fans were delighted to see cameos from some of the studio's most beloved princesses. From more recent heroines (like Anna, Elsa, and Moana) to classic storybook figures like Belle and Cinderella, it was thrilling for audiences to see fairy-tale worlds collide on the big screen. Of course, it was also pretty exciting to bring the characters together for the animators working behind the scenes, too. In our exclusive bonus clip from the film, above, you can get a taste of what a monumental - and fun! 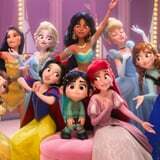 - task having Vanellope (Sarah Silverman) pop up in the Disney Princess clubhouse in the sequel was for the movie's creative team, especially when it came time to give 2D princesses like Snow White a 2018 makeover. "When you see the 2D version [of Snow White], it's just a simple yellow skirt and a simple blue bodice, but we knew they needed to match the detail level of Moana and Elsa," production designer Cory Loftis said. "So it was fun inventing all of that extra detail." Find out even more exciting behind-the-scenes facts when Wreck-It Ralph: Ralph Breaks the Internet comes out on digital on Feb. 12 and Blu-ray on Feb. 26!